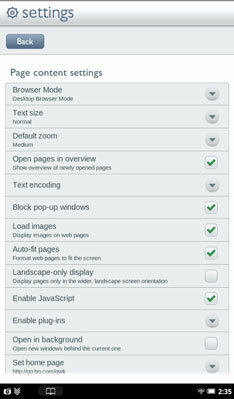 The NOOK Tablet browser offers up five text sizes for website text. Keep in mind that choosing a larger text size will make it easier to read but means you’ll have to move around to see all the information on a page. Tap the text size you want to see in the browser. Your choices are nicely named: Tiny, Small, Normal, Large, and Huge. You can zoom in and out on an entire web page. On some pages that makes more sense than enlarging the text type. To zoom in on a web page, quickly tap two times on the part you want to enlarge. Zoom out by tapping twice. After you zoom in, you can swipe left, right, up, or down to move around on the page. When you start moving around, plus (+) and minus (-) icons appear in the lower-left corner. Tap the (+) to zoom in more. Tap the (-) to zoom out.